Travel with Kevin and Ruth! : 140 feet under water! We were scheduled for the 11:00am departure yesterday, but we were asked to arrive at 10:30am. Arriving early means you can settle your payment, read some of the displays, and use the toilet... there are no bathroom facilities on board the sub, and you will be gone about two hours! Ruth, reading about the sub. As much as I was looking forward to seeing some deep sea life, I was also very interested in the submarine itself. Notice under "depth" it says "approved to 150 ft". Apparently that is the maximum approved by the insurance company. In fact, the hull is designed to withstand pressure up to 600 ft in depth. Signing up for the underwater ride. We had a few minutes to wait, and in that time a bus showed up. There's a cruise ship in port, and most of the other passengers on this trip were from the cruise ship. The sub holds 48 passengers and 3 crew members. I think there might have been a couple of empty seats, but it was a pretty full trip. The back of our boarding pass ticket. When 11:00am came around, we were asked to line up at a dock outside. But there was no submarine to be seen. You actually board a large boat that ferries you out to the submarine site where the sub is already located doing another tour. It was kind of funny because some people thought they weren't at the right tour. I heard one lady say "we didn't sign up for the boat tour... this isn't a submarine!". Reuel and Terry explaining the safety procedures. Of course they had to go over safety for the boat, and then safety for the sub itself. The Atlantis submarine fleet has a 100% safety record. There has never been an emergency incident since the company began operations in 1987. And in fact the submarine that we were about to board, the Atlantis XV has done literally thousands of trips without a hitch. We were told that our trip was trip number 15,830 for this particular sub! Watching for the sub to surface. There was already another party on board from another cruise ship. They had to get the sub tied off onto our boat and it was quite a process because it was a bit windy and it was hard to get right up alongside the sub. Then, they open the hatch and of course only one person at a time can climb out of the two ladders. So if you've got 48 people it can take some time. And then we were on board! Interesting to have a look around! And it's true. You can see from anywhere on the sub, so there's no need to rush to get on to get a particular seat. It's maybe a little more interesting to sit close to Captain Robert, and we were lucky to get a seat near the front. But otherwise, you will have no problem seeing what you want out of the side windows (which are made of 3" thick plexiglass!). Captain Robert has a big front widow! Yes, we are at 5 ft depth right now. Everyone has a nice big window to see out of. And there are placards around the sub explaining what types of sea life you might see. Around 11:50am, we began our descent! Submarine selfie. Are we looking a little green? It wasn't long before we saw lots of fish! That looks like a ship in front of Captain Robert! Yep, that's the Lord Willoughby. It's been sitting there for 42 years! Look right at the bottom of this photo! Unfortunately, we only saw one sea turtle. And he was on the port side of the sub, and swam underneath and then disappeared. So I tried to turn around and get a photo, but that's the best I could do! I think the lowest I saw it go was 141 ft. It was 12:50 when we started rising up. We had been under water for a full hour! Boy, time went by fast! Amazing how quickly you can rise from 140 feet down. Actually, they told us that if there were to be an emergency, it will take in between thirty seconds and three minutes to rise to the surface. We looked at each other and said "well, that was a good time!" Really interesting stuff, and another item crossed off the bucket list, so to speak. We disembarked and got back on the ferry boat for the ride back to port. 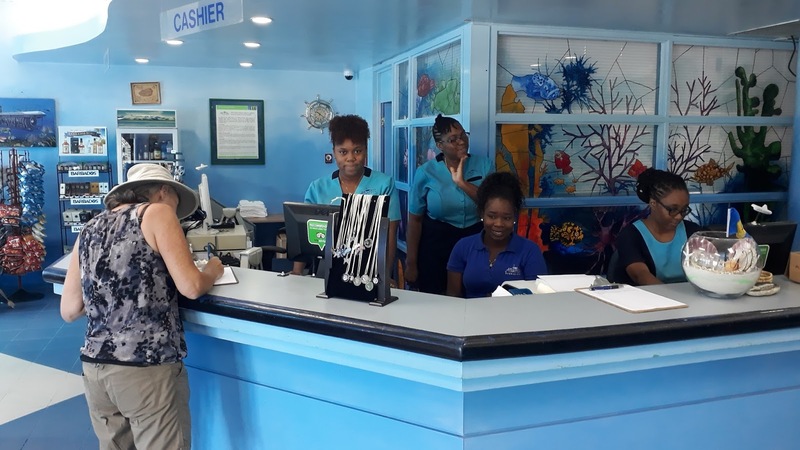 They give you a complimentary rum punch, and when you arrive back at the office, they have your official certificate saying that you are now a submariner! 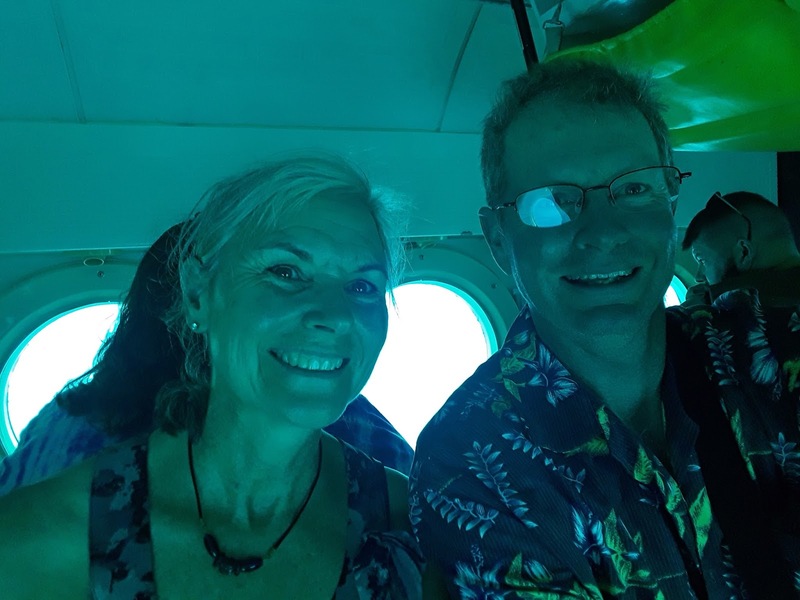 We did the submarine ride in Grand Cayman a couple of years ago, same company. It was really cool, would do it again in a heartbeat! Glad to hear that you loved the experience as well. 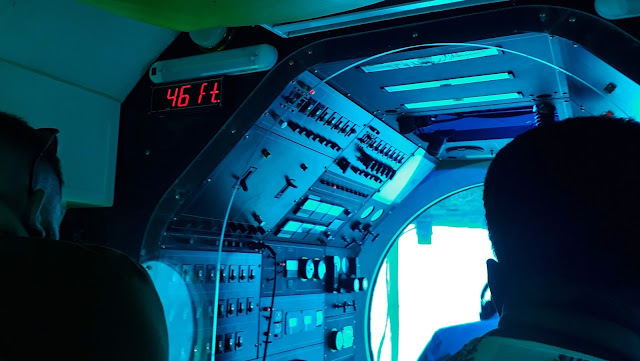 It was definitely pretty cool to do just for the experience itself on being in a submarine. Sure looks like you had a fun day sure would be interesting. 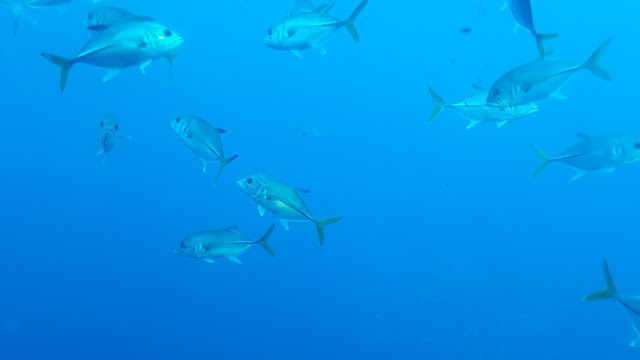 It was very interesting, and we were able to see things that we wouldn't have been able to see if we had just gone snorkeling. I have been lucky enough to do that sub ride twice, the price hasn't changed much in 20 years. I did it once in Honolulu and once in Cozumel, a really fantastic experience both times. You got some great pictures, glad you got to see some fish! Very cool! My bucket list just got a little longer. They really pack you in like sardines, don't they? Lol, yep but surprisingly enough we didn't feel cramped at all, that may also depend on who your neighbour is! looks interesting but I don't think I could wrap my head around it... I would rather watch your video and see you pictures at this point in time. Looks like you all had a great time! Sounds like quite a few of our readers have done this before. Glad that you enjoyed the experience as well. Now that my friends is really something. Worth the trip to Barbados alone. Too cool! Definitely! It is certainly one of those things that you should do at once in your life. So glad that we did, it was a great experience. Now that is an adventure I don't think we will ever experience. I was getting a bit nervous each time you showed how far down you were. I think 141 ft. is far down to me. Glad you two enjoyed the adventure. I enjoyed the videos...the closest I want to get to a submarine. Believe it or not if you didn't see the numbers going down you would have no idea how far down you were. We never felt claustrophobic and never felt any difference in pressure. 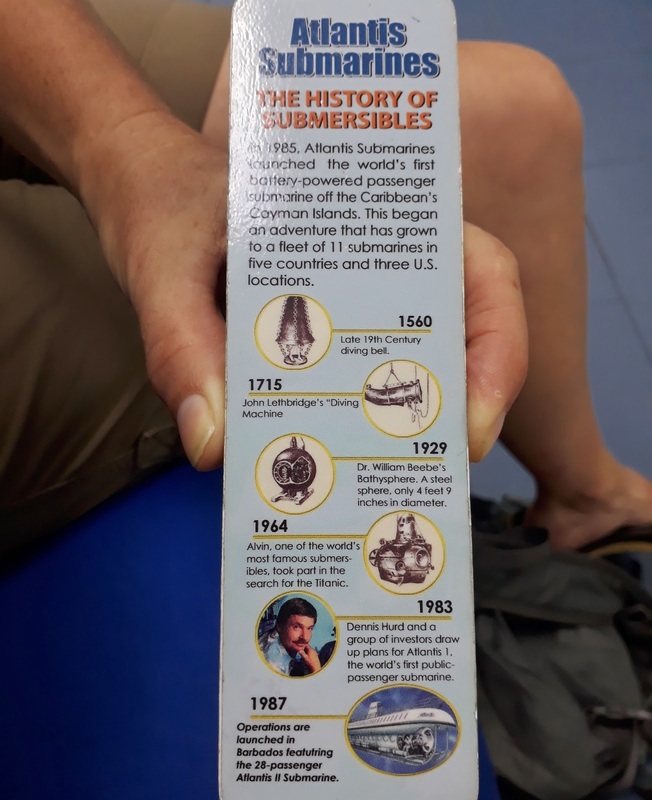 They also had special equipment for you if anything should have happen and in all their years they have never had any safety problems with any of their submarines.